How much does it cost to travel to Puerto Madryn? How much money will you need in Puerto Madryn? Additional pricing is in the table below. These average travel prices have been collected from other travelers to help you plan your own travel budget. How expensive is Puerto Madryn? How much money do I need for Puerto Madryn? Puerto Madryn is mostly known as the gateway to Peninsula Valdes, welcoming tourists who come for whale watching. The Peninsula Valdes is a nature reserve designated as a UNESCO World Heritage site; 97 km long and 63 km wide, it is connected to the continent by an isthmus of 35 km from which we can see both gulfs, San Jose at north and the Nuevo at south. While some may prefer the nature and charms of the only small town of the Peninsula, Puerto Pirámides, to accommodate, the small beach resort of Puerto Madryn offers a stroll along the seaside, numerous hotels and souvenir shops and is probably the liveliest city of oceanic Patagonia. For whales' lovers, September, October and November are the best months even though it is still possible to see some from end of June to end of December. From July to September, the migrating whales come so close to the shore that they can be seen from the coast 20 km north of town or from the town's pier. 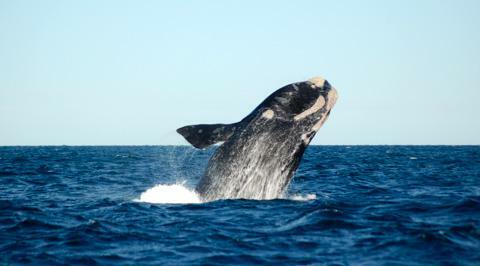 However, there is more than whales to Puerto Madryn. The city offers plenty of wonderful activities such as walking with penguins, snorkeling with sea lions, enjoying the beach, fabulous museums and you name it! Beware of the sun during your stay in Patagonia, as the ozone layer is extremely thin there. Gaiman is a small town 17 km west of Trelew on the Ruta 25, on the green and flowery edge of the río Chubut. You will find there a few delicious casas de te, which takes us back to when the town was colonised under welsh influence. If you decide to wander around Gaiman for an afternoon, you can also appreciate a few historic buildings such as the town's first school and first house, build in 1874 on a street named Juan Evans. Also, the old train station of the town has now been transformed into the Museo Gales (opened from 15h to 19h30 every day), where you can see a few photos about the Welsh colonisation of this area. The Punta Tombo reserve is situated further down, 120 km south of Trelew and 180 km south of Puerto Madryn, and is accessible by car (2h30 from Puerto Madryn on a road of good condition) or with an organised excursion booked in an agency in Trelew or Puerto Madryn. The reserve, known for its enormous penguin colony that arrived for an unknown reason in 1820 and since then come every year, is opened from mid-September to mid-April every day from 8h to 18h (USD$10 entry fee to the park, reduced entry fee for under 16 years old and free under 6 years old). A snack bar is available at the entrance of the reserve and a shuttle will bring you from there inside the reserve. You should count about an hour to walk around the authorized trail in the reserve. There are a few interesting museums around Puerto Madryn. The Museo del Desembarco (USD$1 entry fee, opened everyday except Tuesday from 9h to 13h and 15h to 20h from December to February and from 15h to 19h from March to November) looks at the history of the first Welsh colonies in Patagonia. The Museo provincial del Hombre y del Mar (USD$1 entry fee, free on Tuesday and for under 12 years old, opened every day except Sunday from 9h to 20h or 19h from March to November and on Saturday from 15h to 20h or 19h from March to November) looks at the current human threat to the environment. Finally the Ecocentro: (USD$7 entry fee, found at Julio Verne 3784, opened everyday except Tuesday from 15 to 19h, as well as Monday during March and April, opened from 17h to 21h during January and February) provides simple explications, translated into English, about the local fauna in a very modern and well made exhibition. The information given at the Ecocentro can be quite useful before going on an excursion to Peninsula Valdes or Punta Tombo. Other temporary exhibitions are also presented and do not forget to admire the beautiful viewpoint on the Golfo Nuevo from the bar's terrace or from the museum's library. There are many sport activities available for adventure seekers around Puerto Madryn. Opt for a bike day on a VTT with Na Praia around the seaside (circuits of different levels, from 17 to 40 km long on marked trails), horseback riding with Antonio Pereyra at the equestrian centre 4 km south of Puerto Madryn, scuba diving, windsurf and canoe kayak with Napra Club or Scuba Duba. There are some decent restaurants throughout the town, most of which specifically cater to tourists. It is no surprise: fresh fish and seafood is what you need to eat in Puerto Madryn. There is a wide selection of bus companies, such as Andesmar, El Pinguino and Via TAC, that travel directly from Buenos Aires' Retiro station to Puerto Madryn (about 17 hours long). The coaches are comfortable and have a few seats options for different prices. Meals and drinks are served on board, all have toilets and films are also shown during the trip. Flights are about 2 hours long and only depart from Buenos Aires with Andes Airlines. Puerto Madryn's Airport (PMY) El Tehuelche is only 10 minutes away from the city center. Another domestic flights that you can get from Buenos Aires to reach Puerto Madryn is with Aerolineas Argentinas, which flies daily to Trelew, only an hour away from Puerto Madryn by bus.